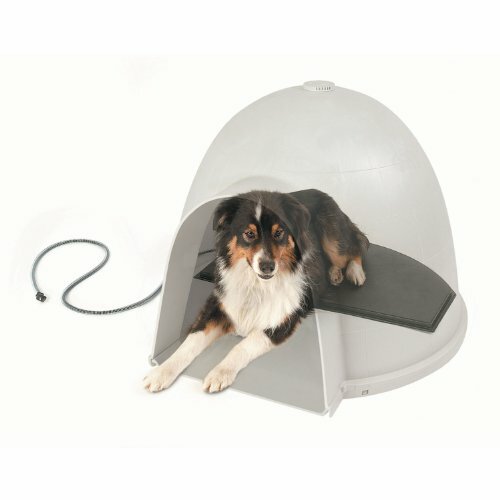 A K&H exclusive, the Lectro-Kennel Igloo-Style Heated Pad is the perfect add-on for every Dogloo or Indigo house. The half-round shape covers half the floor surface allowing pets to naturally choose when they want warmth. It comes in three sizes, and is easy to clean and waterproof. It uses an internal thermostat to keep the temperature at a desirable 102 when the pet lies upon the pad. The unit is constructed of a rugged ABS plastic and a steel wrapped cord to ensure your pet’s safety. The mat now comes with a free removable fleece cover. The cover is made of faux lambskin and is machine washable.